ACTION Alert — Congressional Bipartisan Support for RFCC Citizen Petition on Interstate Transportation of Raw Milk. On April 26, 2017, RFCC filed through their legal counsel (Emord and Associates, a Washington DC law firm with extensive experience in food regulation) a citizen’s petition with the FDA to exempt farmers from draconian enforcement if they provide warning labels and a recipe for pasteurization on raw milk products. A letter has been written and is about to be sent by Congressional Representatives Smucker (R-PA) and Pingree (D-ME) asking that the FDA rule in favor of the RFCC petition. Real Food Consumer Coalition (RFCC) was established by a group of concerned consumers after learning that their Pennsylvania farmer was having troubles with the USDA due to his Private Membership Association having issues protecting them. Ms. Reitzig , an accomplished and outspoken raw milk activist, quickly approached other leading raw milk advocates and core real food organizers to establish a coalition based on the fact that consumers need to be represented and protected as much as the producers are. RFCC was born. RFCC’s first action was to take on Amish Pennsylvania farmer, Amos Miller, and his extremely serious USDA contempt of court issues. Through months of counseling Mr. Miller, as well as negotiations and strategy between Miller and the courts, Amos Miller’s contempt of court charges were dropped. A grand victory! RFCC’s next action was the April 26, 2017 Citizen Petition on labeling raw milk products with the FDA. RFCC organizers approached renowned FDA attorney Jonathan W. Emord of Emord & Associates requesting feedback an interstate labeling concept. Emord is a highly successful and respected attorney who has defeated the FDA on many occasions. Serendipitously, Mr. Emord had long thought about a very similar labeling concept. Mr. Emord came on-board bringing attorney Bethany Kennedy and their vast legal experience and enthusiasm! The petition was filed on April 26, 2017. 12-12-17 Who Was That Masked Man? RFCC is comprised of thousands of consumers, farmers and real-food advocates who believe in their inherent right to freely choose the farmers and foods to feed themselves and their families. The coalition is quickly growing with new organizational partnerships and allies every week. Liz Reitzig is the founder of Real Food Consumer Coalition (RFCC) and NourishingLiberty.com . In 2007 Liz founded Grassfed On The Hill, a local GMO-free food buying club that serves the greater Washington DC metro area. She is the co-founder and spokesperson for Farm Food Freedom, she is an event speaker, activist and Mother of 5! Liz has appeared as a raw milk spokesperson on several national radio and television shows, has been subject matter in national newspapers and has been featured in the documentary Farmageddon . Her most recent appearance was as a guest with Dr. Ron Paul on his Liberty Report show. Liz Reitzig has spent a decade working on the politics of food access in support of small farmers and those who wish to obtain food directly from them. She believes that everyone has the right to peacefully access the foods of their choice from the producer of their choice. Her work on several key cases and her proactive approach to policy and activism have helped shape national and state level food and farming policies. Firm beliefs in producing our own food, supporting our farmers and nourishing our families is not enough. Liz feels that sometimes further action is needed, and we are called to act in ways that might stretch us past our immediate comfort zones. Through inspiration and action, she continually leads by example in showing us the most beautiful opportunities we are given, to serve our fellow human beings. for RFCC Citizen Petition on Interstate Transportation of Raw Milk. On April 26, 2017, RFCC filed through their legal counsel (Emord and Associates, a Washington DC law firm with extensive experience in food regulation) a citizen’s petition with the FDA to exempt farmers from draconian enforcement relating to interstate transportation of raw milk if they provide warning labels and a recipe for pasteurization on raw milk products. "The New Jersey State Grinch That Stole Christmas Dinners?!" 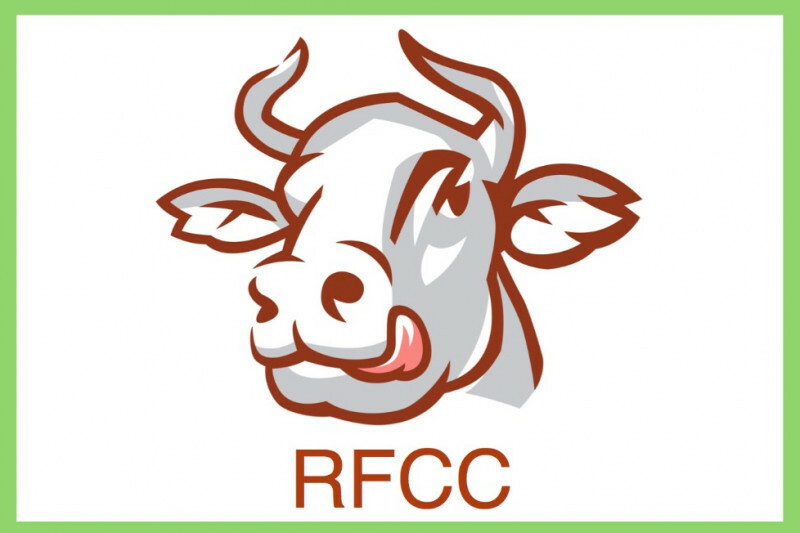 RFCC is closely monitoring and seeking solutions to issues regarding NJ residents/individuals that are under attack from New Jersey state and county agencies for choosing to drink raw milk! Please contribute as we raise awareness and funding to help these individuals and their communities that rely on the fresh, healthy and nutrient dense foods that NJ agencies are trying to keep them from procuring! Raw Milk Consumers Under Attack In New Jersey! Most of the communities are in the south and central part of the state. Among those targeted by the NJ Department of Health are Cranbury, Princeton, Plainsboro, S. Plainfield, and Summit. Most of them include significant numbers of Indian and other Asian immigrants. Last week, the NJ Department of Health disputed one of my posts alleging that one of its investigators was involved in targeting these communities. It turned out that the investigation was likely carried out by one or more county health department investigators. But clearly, the NJ Department of Health was calling the shots. The targeted residents say the letter’s accusations are untrue, that they aren’t either selling or distributing raw milk in New Jersey. The milk is purchased at a farm in Pennsylvania, they say, and residents have it brought to the homes of volunteers in NJ who hold the milk until neighbors can pick it up. These volunteers don’t handle money and aren’t paid. 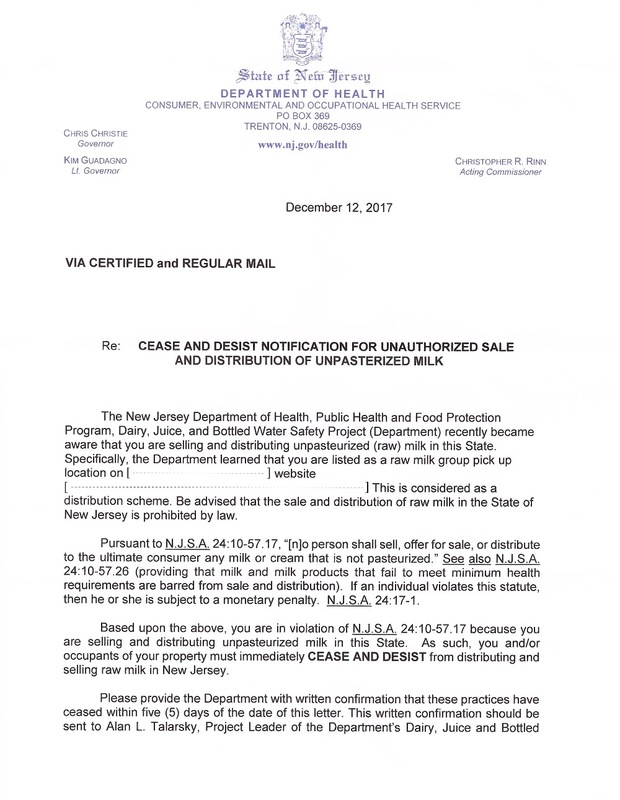 Presumably the FDA doesn’t see the NJ residents as fitting into its 2011 exception statement, since the agency gets involved in pretty much every situation alleging interstate sale and/or distribution of raw milk, and should be assumed to be involved in this one, helping guide the NJ Department of Health. At least one food rights organization, the Real Food Consumer Coalition, is monitoring the New Jersey situation. It is seeking to provide the recipients of the cease-and-desist letters with legal assistance, and asks that supporters direct new funding to its fund-raising web site to aid in that effort. Advocates for direct farm-to- consumer food rights, the Real Food Consumer Coalition (RFCC), have filed a petition with the US Food and Drug Administration (FDA). This petition, when accepted by the FDA, would eliminate an important layer of FDA regulatory enforcement against raw milk farmers—the agency’s ban on interstate transportation or sale of raw milk. Farmers would be exempt from enforcement of this regulation if they provide warning labels and a recipe for pasteurization on raw milk products. The warning labels are similar to labels currently required in many states. The recipe for pasteurization is included so that individual consumers can make their own choices about how to best handle the milk. This petition asks the FDA to accept such labeling for raw milk products, as an alternative to its draconian prosecution of Amish farmers and others who for centuries have produced and consumed raw milk products. Emord and Associates, a Washington DC law firm with extensive experience in food regulation, filed the citizen’s petition with the FDA on April 26, 2017. The FDA legally has 180 days to respond. While we await the answer to the petition, attorneys for any farmers cited (now or during this waiting time) for non-compliance with CFR1240.61 can file a motion of stay for their clients pending the response to this petition. During the 180-day period, advocates for consumer choice will work with Congressional representatives to push for a legislative and more permanent repeal of the regulation in conjunction with the request in the petition.